I love the chubby cheeks bears!! You all have done a GREAT job!! I just wanted to add that I do make a few stitches, from the top of the cheek ( right under the outside corner of the eye ) to the bottom of the cheek ( one side at a time). It is hart to explain and I am NOT too good at it!! At the same time I am making sure that the stuffing is toward the chick, working it with the needle if is needed. 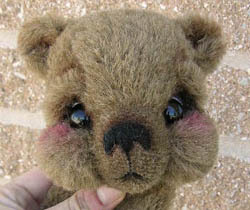 The stitches not only, when you pull can give a puffier cheek but, it helps to keep the stuffing secure in the cheeks. I hope that you can understand ?? I made the bear's head last night. Here is another new design I call Cheeky Chops. I also designed applied cheeks for this bear. Judi, those are great! Love them! 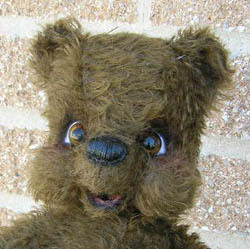 I have a pattern somewhere that was given to me, it also has cheeks like your bears, but your bears are soo much better! You've got a marvelous look, I love your bears, they are so cheerful. someone's hiding all the acorns in their cheeks Judi! THose designs are great....I like how one looks so feminine and the other like a mischevious little boy. Oh Judi! They are so adorable! I just wanna pinch those little cheeks... lightly and with clean hands of course!!! Thanks! I laughed when I read the bit about acorns , Melissa! I think the first picture looks kind of like a chipmonk. I think that design will be a one of a kind never to be duplicated. 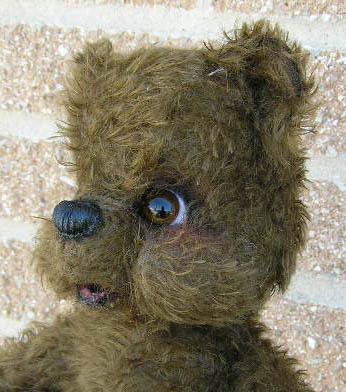 I am making more of the second bear. I like that one better than the first. 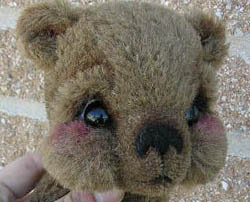 I have been wanting a bear with cheeks and instead of trying to figure out a side head design, I desgined spearate cheeks to be sew on. They blend right in with the mohair. They really make me smile Judi!!! I love the puffy cheeks!!! the #1 !! so please make duplicate !!! May I try your idea ?? :pray: please !! 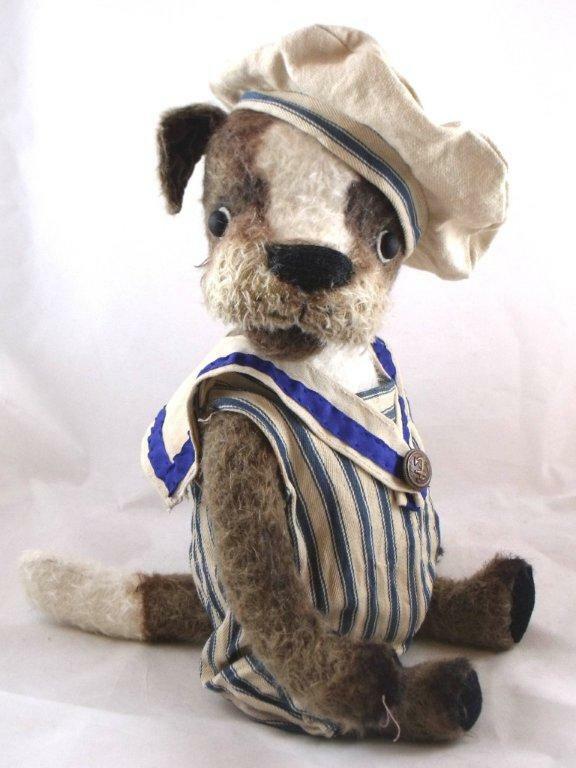 PLEASE make a chipmunk! You could paint his stripes just right, too! I have also been experimenting with puffy cheeks -I have made a double skin and stuffed them -bit hard to explain but you can put your finger up inside the cheek. That's terrific, Jo - perfect for a pup! http://www.teddy-talk.com/img/members/2 … r-003.jpgI do my long haired bears like Melissa explained but I have one on the go at the moment that has short hair that I have tried to get puffy cheeks on. He's not quite finished and doesn't have a name yet but I am pretty happy with his little puffy cheeks. I cut his muzzle a little larger so that there was room to "stuff some cheeks".